The Elliott Wave pattern is a structure that defines how a stock behaves. All stocks tend to move in a basic five wave structure that consists of a motive phase and a corrective phase. For swing traders, the motive phase is what we are interested in. You will see that the Elliott wave theory falls neatly into my favorite type of trade: The First Pullback Trade. Note: Take this 10-lesson Elliott Wave course. It's free and it goes into much more depth than what is on this page. The motive phase of an Elliott wave cycle consists of five waves. You can see the waves labeled on the chart above numbered 1 through 5. Think of the motive phase as a detailed view of an uptrend. The corrective phase is labeled on the chart above as Wave A, Wave B, and Wave C. This is the phase that "corrects" the uptrend. We are not really concerned with this phase, but I wanted you to learn the basic cycle! This wave breaks the previous downtrend and begins a new uptrend. This marks the beginning of the trend. You want to start watching for a pullback when this wave starts. The pullback! Now you want to start looking for an entry using candlestick patterns. This sets up our First Pullback scenario. You are hopping on board at the beginning of an uptrend. 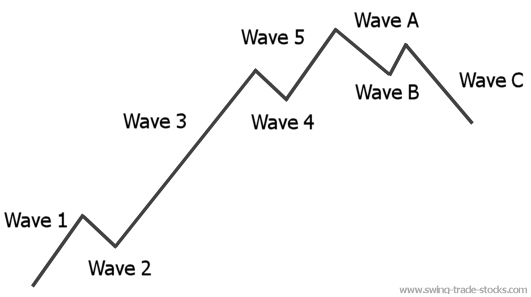 Wave three of an Elliott wave cycle is the longest and the strongest of all five waves! That is why we want to get on board during wave two (the pullback) right as wave three is beginning to unfold. When you can find stocks that are beginning a wave three, you want to hold on to your position for a longer time frame. Don't treat is at a little swing trade, instead, treat it as a trend trade. You want to ride this powerful wave to completion! Why? Because you will make the most amount of money in the least amount of time. Ya, gotta love that! This wave is pretty disappointing for those that bought this stock too late. The stock moves a lot slower and is a signal that the best part of the trend is over. Again, this wave is usually sluggish and not near as dynamic as the third wave of an Elliott wave cycle. This also marks the last burst of buying before a new downtrend starts. These waves finally start the downtrend. You will notice that wave A looks like just a regular pullback. Nope. This is a bull trap. You will also notice that wave B doesn't get higher than wave 5. This is the first pullback of the downtrend and wave C is the third wave in a downtrend!! This is where you would look for shorting opportunities. This is the basic structure of an Elliott wave pattern. There is a lot more to Elliott wave theory, but some of it can get very complicated. Also, sometimes it can be very difficult to identify exactly which part of the cycle a stock is in! Take the 10-lesson Elliott Wave course.